Pre-heat oven to 425 degrees. 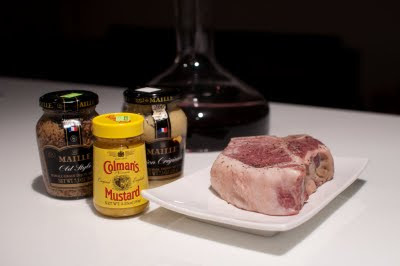 Mix the three mustards together in a bowl and coat the first side of the chop, avoiding the lovely fat on the edge of the chop. Cover the mustard side with breadcrumbs, coat the clean side with mustard, and subsequently coat that side with breadcrumbs. 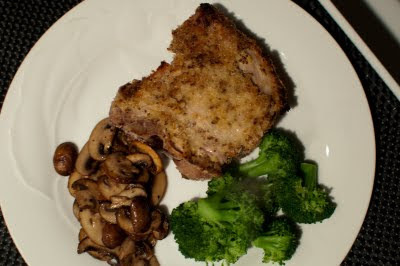 On a broiler pan (covered with aluminum foil for easier clean-up) put the pork chop in the oven. After 10 minutes, the first side should be slightly browned. Turn over the chop and put back in the oven, raising the temperature to 450 degrees. After another 10 minutes, check the chop for doneness. It should be reasonably medium at this point. Turn up the oven to broil and crisp both sides of the chop until the breadcrumbs are browned. Remove from the oven and let the chop sit for 5 minutes. Serve. Peybonhomme 2005 Quintessence de Peybonhomme. I love the Peybonhomme and La Grolet wines and after reading a couple of reviews was hoping and expecting perhaps a little too much. Still a great bottle and an excellent value, but may be just a little closed right now. I could sense something interesting there and there is definitely a solid structural backbone. It is a lovely weight and is balanced. There are some red fruits and some cocoa and the tannins worked really well with the pork chop - especially the crispy fatty edge of the chop. I am going to give this another try, but I just think I prefer the base bottling for everyday drinking and the La Grolet Tete de Cuvee for something a little more serious. This sound delicious. I'm going to try it and tell my SuperNodes (wine and networking group) about it too.